Firefox add-on for discovering websites, images, videos and more. Is there a better alternative to Smart Suggestor for Firefox? Is Smart Suggestor for Firefox really the best app in Plugins category? Will Smart Suggestor for Firefox work good on macOS 10.13.4? Smart Suggestor for Firefox is the best all-in-one Mozilla Firefox browser add-on for instantly discovering websites, images, videos, tweets, articles and much more! With Smart Suggestor, you'll use fewer browser tabs, find what you are looking for faster, and accomplish more in less time. Enhanced Search - Search Google, Bing, or Yahoo for websites, Wikipedia articles, videos, images, and Twitter in ONE search. The results are organized to help you find what you are looking for fast! Smart Suggestor for Firefox needs a review. Be the first to review this app and get the discussion started! Smart Suggestor for Firefox needs a rating. Be the first to rate this app and get the discussion started! Smart Suggestions - Get Smart Keyword Suggestions in Google, Bing, and Yahoo to discover new keywords for more specific results. 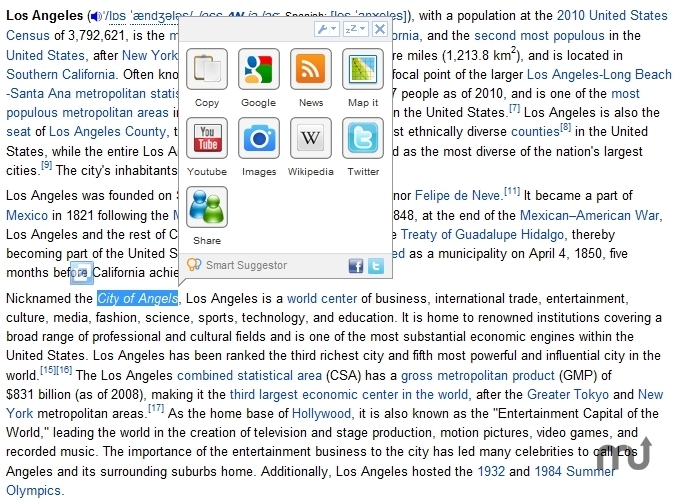 Smart Highlights - Highlight text on any webpage and instantly search for that text on Google, YouTube, Google Images, Wikipedia or Twitter. Smart Maps - Highlight any address and get a Google Map of that location instantly. Shopping Suggestions - Get shopping suggestions right in your search results! Sharing - Easily share any website you are on with friends and family on Facebook or Twitter. Similar Sites - Similar site recommendations help you discover new websites. Smart Address Bar - Turn your address bar into a search engine. The Smart Address Bar recommends keywords while you type to help you get where you are going faster. Turn off any Smart Suggestor feature for full control over how you surf the web!